In general, office work can be divided into two main processes: the concentration and the communication. The main challenge in office planning is to find a balance between these two activities, which would correspond to the type of the company. Law firms impose different requirements than trading companies, banks differ from project offices. The best solution for concentrated work would be a separate room, while open space is more suitable for communication. A floor plan is developed from the interaction of these two extremes. Private offices, open offices and combined spaces are the most common types of work space. Traditional office consists of separate rooms arranged along the corridor. This office scheme creates an atmosphere of privacy and tranquility. However, it is practically impossible to implement teamwork in these conditions, employees’ communication is difficult and use and space is used inefficiently. This solution is suitable for companies separated into departments consisting of a small number of people. There are two kinds of cabinet type offices. The first are rooms for one or two people, so called shared offices. They are characterized by a maximum privacy, a clear spatial organization, inability to work in a team and the lack of flexibility. The second type includes offices consisting of larger rooms, designed for four to ten people to work in them. This gives rise to a certain collective spirit, which, however, applies only to a small group of people. At the same time this can cause problems in interaction with other departments of the company. This workspace type is characterized by a relative privacy, weak team spirit and limited flexibility. A team space is a variety of open spacing. It is an open space, which is divided by low partitions into separate areas. Intensive communication is possible only within small groups. The space is used with the maximum efficiency and flexibility, and collective spirit is high there. The lack of soundproofing and the lack of privacy are the main drawbacks of this office type. Vector stencils libraries Office Furniture and Office Equipment contain shapes of office furniture and equipment for ConceptDraw DIAGRAM diagramming and vector drawing software. 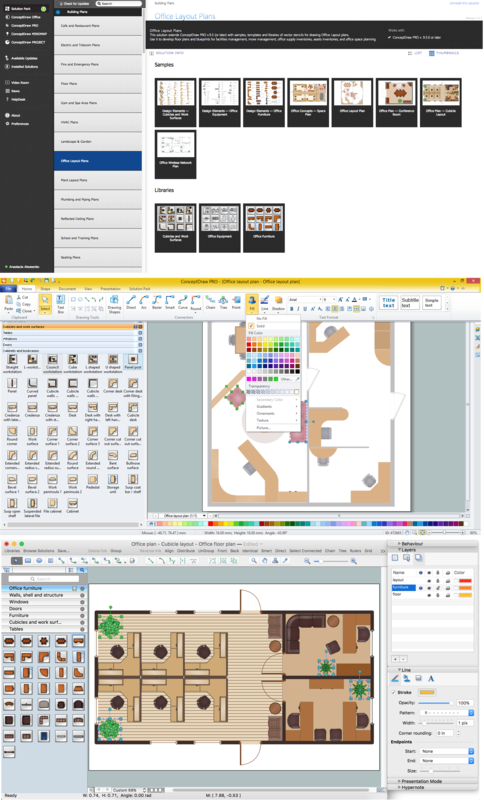 Use it to draw office interior design floor plans, office furniture and equipment layouts, and blueprints for facilities management, move management, office supply inventories, assets inventories, office space planning. The Bathroom library contains 41 vector shapes. The Cabinets and Bookcases library contains 38 vector shapes. The Cubicles and Work Surfaces library contains 46 vector shapes. The Doors and Windows library contains 20 vector shapes. 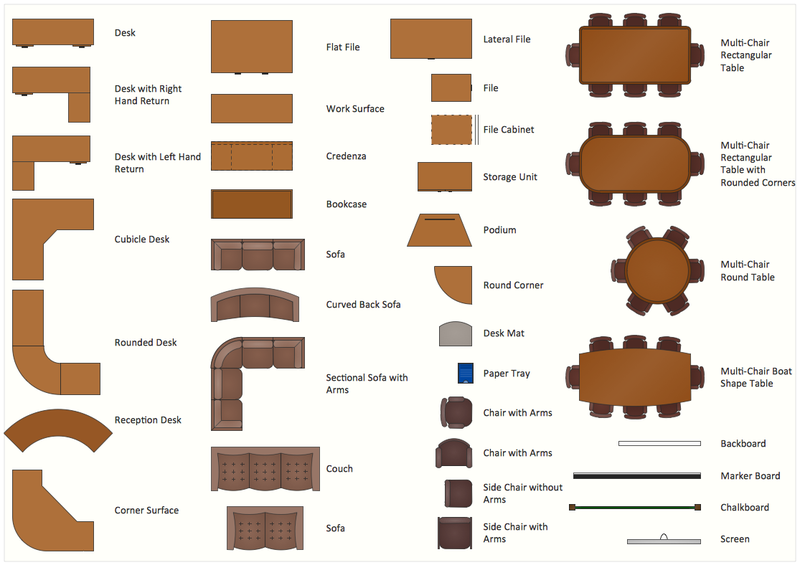 The Furniture library contains 38 vector shapes. The Walls, Shell and Structure library contains 29 vector shapes. Solution Office Layout Plans from ConceptDraw Solution Park provides 9 vector stencils libraries with design elements of office equipment and furniture for drawing Office Layout Plans. Use it to develop floor plans and blueprints for facilities management, move management, office supply inventories, assets inventories, and office space planning.